Address: 1002 S. Vista Ave.
​ on weekends! We will be closing at 5pm on Friday, April 26th to prep for our sold out Ladies Night. 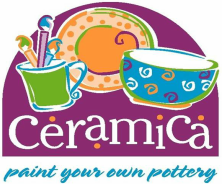 Mother's Day is always busy at Ceramica so we'll be open 11am - 6pm for your painting pleasure. Please make a reservation to (208) 342-3822! our new hours below effective 1/21/19!